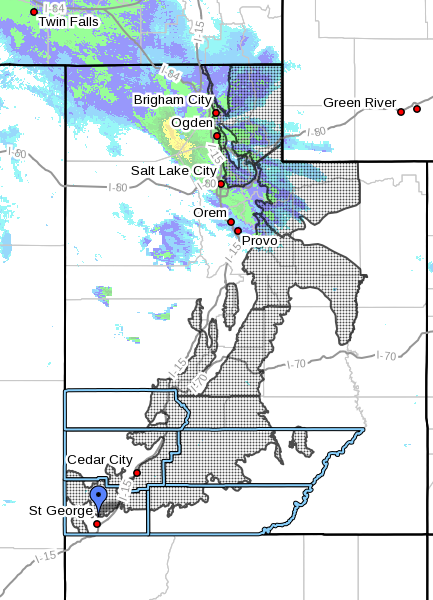 ST. GEORGE — The National Weather Service in Salt Lake City has issued a winter storm warning for heavy snow and strong winds in central and northern Utah. This warning is in effect from 4 p.m. Thursday to 4 a.m. Saturday. The Wasatch mountains, I-80, the northwestern Uintah mountains, the Wasatch plateau, Book Cliffs and the Central mountains. Cities affected include Woodruff, Randolph, Mirror Lake, Scofield, Cove Fort, Koosharem, Fish Lake, Loa, Panguitch and Bryce Canyon. Southern Utah will miss the precipitation, which is not expected to come too much farther south than Bryce Canyon and Panguitch. Snow will begin late Thursday afternoon, becoming heavy at times through Friday. Snow accumulations of 12 to 24 inches are possible above 8,000 feet through Friday, then lowering Friday afternoon and evening. Winds will be gusting west to southwest 30 to 40 mph with gusts in excess of 60 mph at times through Friday morning. Winter driving conditions can be expected across all mountain routes above 8,000 feet, including the Wolf Creek pass, the Wasatch plateau and state Routes 14 and 143. For more specific information on roads and highways see UDOT’s road weather alert webpage. Snow accumulation may cause travel difficulties. Be prepared for snow covered roads and use caution while driving. Printable/Saveable PDF: Vehicle Preparation and Safety Precautions for Winter Weather.